#weekchallenge UPDATES 3.0 - Posting & Daily Theme Rule Changes and Brackets Alterations. I'm feeling that in the moment it is the best time to be as active as possible, because we could be very close before a big Bearshares Boom currently and so all your rewards you are earning here on Bearshares in the moment, could be worth many many more in some weeks or months. This update is specially for the daily theme that we use under #weekchallenge. All the themes are same as before but we made some changes in the content posting rule of everyday theme cause some users has little confusion about some theme and most of the users using same kind of random photos for weekchallenge all the day. From today onward everyone should follow the posting rule to avail the vote from the moderators. Also we reduce the voting percentage of the moderators by 5% and we will increase the value to higher percentage on our next update. Monday is the beginning day of a week, so it should be a colorful day. On each Monday you bearer's can post any of the colorful photographs from you. It can be anything. Only one rule applies. Your photographs must have a sense of art and color variety. It would be nice to know what photographs you would like to feature, which isn't part of the daily theme. Everyone has their own choice for everything, I don't want to break that. So here in this #weekchallenge also I gave a space for your choice on wednesday. In this day of every week you can share anything animate (people, or animals, or things) under the #yourchoicewednesday. In this day you should post a photographs of inanimate objects from your daily life under the tag #randomlifethursday. What exactly you have to do is post a random photographs from your day that you think should share with someone. Also note that the same photograph (taken from the same angle or a different one) cannot be posted twice within a 3-month margin. We love travelling and it's the best time to capture new and different things at different places. So I allocate a day of #weekchallenge for the travel photography, #travelfriday. It could be anything related with your travel time. It is also an opportunity to show the community exotic or fun locations which you visited for leisure or tourism. #travelfriday photographs should not be common day-to-day images of you and your friends relaxing. It should include interesting locations that would captivate the audience. Monochrome is abstract, color is not. Looking at a black and white photograph, you are already looking at a strange world. Personally this is my favorite #weekchallenge. You can post any of the monochrome photos in this day under the tag #monochromesaturday. It would be nice to include the original (colored) photograph of #monochromesaturday, but be sure that Monochrome photo should come first in the article. 3..2..1 Weekend, we are all eagerly waiting for the whole day even if we are in school, college or in job. Parties, family picnic wow. Under the tag #weekendsunday you can post the beautiful and memorable moments of your weekends. The main/first tag should be #weekchallenge. Any of the secondary four tag should be corresponding day tag like #monochromesaturday or #colorfulmonday. No need to do all the week day's. It's better if you could, to be active on Bearshares. And of course, post only one post a day under each day tag. To keep the #weekchallenge themes interesting and interactive, every photograph must have a short write up of at least 70 words to inform viewers what makes that photograph special or #weekchallenge worthy. Spam posts and plagiarism is highly prohibited as this is a gross misconduct in community acceptable behavior. Users found spamming or plagiarism other contents (articles or photographs) with #weekchallenge tag, would be become blacklisted by @weekchallenge and @letsgheek. 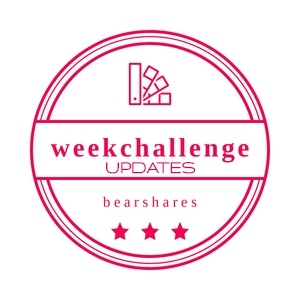 Accounts may be flagged if spamming or plagiarism with #weekchallenge tag continues. If an account is blacklisted, the only way to redeem the account is if quality photographs/contents are posted 5 consecutive times using #weekchallenge. The account is then reviewed and pardoned. The #weekchallenge service was created to help and give Bearers some extra exposure and awesome upvotes from @letsgheek and @weekchallenge. As a member of #weekchallenge service, you all are responsible to post quality and original content also report if you found any plagiarized content in #issue channel in our discord. We check manually and upvotes to all our participant if they post and make a daily report of that on daily basis to updates you to check for any missing upvotes. It has come to our attention that there are a lot of members that participate with #weekchallenge, but that are not actively supporting the services's growth. This is not a necessity but is always much appreciated. We tend to give more support to those who return the favor. You are not just supporting #weekchallenge but all 50+ members who are daily participate in #weekchallenge. Most of our profits go toward #weekchallenge so any upvote helps all of us. But if you show some participation or support to #weekchallenge we feel they deserve some better rewards from #weekchallenge moderators @letsgheek and @weekchallenge. That's where we made some changes in our upvoting systems. We made two Brackets like "Supporters" and "Participants" of the #weekchallenge. Why me made these is clearly explained above. Above you will find the upvoting pattern for each Brackets. That's it, just have fun and if you like, share this challenge by Rebearss and upvote this post. Let's become a part of this beautiful #weekchallenge. @weekchallenge & @letsgheek hold the rights to upvote or choose not to upvote accounts where the contents/photographs are not up to #weekendchallenge quality standards. All rights reserved. Thank you @jasimawf, really love it. You are always welcome, we all waiting to see your post.. This is super great of you. You have explained it all in details and so it is left for us all to comply to the rules here if we still want to be part of #weekchallenge.